Originally published May 16, 2011. Updated by Paula Melton June 1, 2018. Over dinner recently, I asked what was one key lesson that he would want to impart to any new driver. While he was thinking about it, his wife lit up and offered this advice (which I'm sure is not from the company manual): make sure your seatbelt is removed before you begin a hot swap. While I'm sure that experienced drivers can "hot swap" quite, um, professionally, it is an inherently unsafe practice. This is underscored by the fact that you have to remove your seatbelt, in a speeding tractor-trailer, before you can even begin! Unfortunately for the builder, homeowner, or renter who simply wants some reliable advice on what to worry about from an environmental perspective, and what not to worry about, things sometimes change or crop up unexpectedly. And we're not usually completely ready with a seamless hot swap. Remember when compact fluorescent bulbs first came out? Remember the first low-flow toilets? Best forget them. Polyurethane is in a lot of stuff, from foam mattresses to bowling balls. When it is fully reacted or "cured," it is stable and its chemistry is not a significant concern. However, Some products, however, such as adhesives, coatings, and spray foam, react while being applied by builders or homeowners doing insulation retrofits, and continue to react for some hours afterwards, and may contain "uncured" isocyanates to which people may be exposed. This is not news: worker protection protocols and quality assurance programs for SPF installation were developed by the SPF industry decades ago. Why the fuss now? EPA's SPF action plan for MDI is being developed within its Design for the Environment (DfE) program under jurisdiction from the Toxic Substances Control Act (TSCA), which requires U.S. chemical manufacturers, importers, processors, and distributors to report to EPA any information suggesting that one of their chemicals "presents a substantial risk of injury to health or the environment." The action plan leaves open questions about how far EPA will go to clamp down on these products, but it's safe to think of this as a shot across the bow from EPA for the SPF industry. In addition to the presence of MDI in the product, the chemical reaction and curing of SPF can produce other chemicals of concern: excess isocyanates, aldehydes, amine catalysts, and other volatile organic compounds (VOCs). We don't know much about the nature and quantities of offgassing of these substances, the curing rates of SPF, or how health risks can change with improper environmental conditions or mixing ratios during the SPF process. To that end, there is a new ASTM standard under development. John Sebrowski, a senior associate scientist with Bayer MaterialScience and chair of the task group working on this ASTM standard, is helping develop a standard practice to establish re-occupancy times after onsite SPF application. "We are currently getting ready to conduct research using micro-scale chambers and thermal desorption techniques to measure emissions," he said. When asked what relationship the current ASTM draft standard and research might have to the existing protocol offered by Bayer MaterialScience (which recommends re-occupancy times of 12 hours and 24 hours for workers and occupants, respectively), Sebrowski responded that the protocol would be used as a starting point, but "we are also investigating other approaches to measuring the emissions." According to EPA, safe re-entry times put forward by manufacturers vary between 8–24 hours for one-component SPF and 23–72 hours for two-component SPF. But more research and standardized testing is clearly needed. EPA is not working alone on this issue; several other federal agencies--including the National Institute for Occupational Safety and Health, the Occupational Safety and Health Administration, and the Consumer Product Safety Commission--are part of the team. Each is concerned about protecting workers or consumers from health effects from the increasingly prevalent site-applied SPF. "I think you have to be careful when you discuss the toxicity of spray foam," says David Price, environmental scientist in the indoor environment division of EPA's Office of Air and Radiation. "I have not seen any information at this point that there is any hazard to occupants." While Price supports EPA's decision to gather data on possible post-occupancy issues with SPF, he doesn't want the public to "find the accused guilty before you hear the case." Price has seen some of the anecdotal evidence as well as some of the scientific findings, and says that no cause-effect relationship has yet been found between SPF installation and post-occupancy illnesses. "It's appropriate for EPA to look at this stuff; that's what we do," Price said. "But I'm very sensitive about tagging a product as 'of concern' or 'may be toxic'" before the data has been gathered and reviewed. Environmental Building News contacted several builders and foam industry professionals, and found that most were unwilling to be quoted on an issue they deemed sensitive and still-unfolding. One leading green remodeler offered this perspective: "I have stopped using SPF in any of my projects at this point. I simply can't and won't jeopardize my clients' health and the reputation of my company by using building materials with the emissions profile of SPF." Since this news came out, comments on message boards that I have seen have tended toward defense of SPF and annoyance (that's putting it politely) at EPA. The undercurrent seems to be: Is the whole industry going to get stained because of some untrained DIYers? Let's hope that the general public doesn't jump to conclusions too rapidly--that EPA gathers its data and that its process works. And let's be real: not all SPF insulations jobs are perfect--some have even ended tragically. Make sure that your SPF contractor installs SPF correctly, employing quality control/assurance protocols such as the following the Spray Foam Quality Control – Canadian Installation Requirements. If you are a homeowner or building manager or employee in a building in which SPF will be installed, follow EPA's Steps to Control Exposure. Also, stay tuned; the SPF industry is working on a new class of SPFs--hybrid non- isocyanate polyurethanes (HPINUs)--that may pose much less serious occupant and worker health issues than our current slate of SPF building products. Note: Peter Yost, Vice President, Building Performance, and Paula Melton, Research Associate, contributed reporting to this column. I live in Michigan, Macomb county, and I was qualified for a weathereization program and the foam insulation was sprayed in my basement without my knowledge that the spray foam was being used. My daughter and I stayed in the house unknowingly we were supposed to be out the house for hours. Now I don’t feel well and my daughter also mention that she’s not feeling well. I think it’s really sad that the county failed to inform me of the risk of spray-foam insulation. Can anyone tell how bad is it to use SPF to seal the joints between concrete rings in water well? I know one water well where it has been used over and under water level. I have been trying to find out since I found out about it has it been good or not so good idea use it as seal? I would be really thankful if someone could answer to my question and explain little why so? I have red most of the messages in here but most of them are about air exposure. Does SPF react with water over or/and under water line? I have been using foam applications in the hollows in floor joists in crawl spacer after encapsulating them for 4 years now or better. The foam applied properly and after curing is basically harmless and a great insulator plus sealant is various situation but not all. Again I state proper application and knowledge how to apply the foam is crucial to its performance. All proper safety procedures must be followed while applying it. Once it has cured again it is harmless. Chemical sensitivity is most likely to happen with a fresh application applied in a none vented area. i had basement gutted in January 2017 and had spray foam applied to concrete walls. Since then I have had sinus pain, headaches, congestion, and tired. I have had MRI, EKG's, ct scan of sinuses. I have taken amoxocillan, now on prednisone. Nothing helps the pain except leaving the house. I have cleaned basement wiping down everything, had ducts cleaned, twice had quality air samples taken and no mold detected, had thermal imaging done on walls, no moisture found, gas checked for leaks, and have found nothing. I have an air to air exchange I run and also have two dehumidifiers. I contacted spray foam company and they find no reason that they have done any thing wrong. I was never told to vacate house when sprayed and wonder if that could be problem. I don't know what to do anymore. Any suggestions? Thank you. I live in Wisconsin and had spray foam applied because I had mold many years ago and remediated by company. While the debate and studies go on there is one form of insulation that has no off gassing, the lowest carbon foot print, biodegradable, and no chemicals added. That is pure wool insulation. It is relatively new to the market, but is readily available throughout the USA, and very price competitive with spray foam. Hi, so in a bit of pickle right now. We searched high and low to figure out what to do for insulation in our 2nd floor Cape House reno. We added a 28 ft shed dormer and didn't want to use spray foam at all for insulation. We had received 1600 sq ft of commercial grade Roxul for free (from my work) that we wanted to use and had to find a company to install it. Long story short, because cross beams were added to the interior framing before the insulation was put in, it made it almost impossible to get polyiso boards in there (over baffles), which we wanted to use before putting in the Roxul. We ended up doing baffles with 1 inch of spray foam over that (which apparently expanded to 1.5 - 2 inches says the company that sprayed it), and then installing the Roxul over that (4.3 R-value/inch) to meet code requirements. The baffles and spray foam were put in on Monday. My husband has asthma and I am 7 months pregnant (I know I know) and even though we are still staying with my cousin since Monday (it's now Thursday), my husband says that when he has gone back to the house, he's gotten headaches from the fumes and he can smell them. He put two fans in the 2nd floor windows today and there are workers upstairs putting up drywall today. I have gone back a couple times (once Tuesday and twice yesterday) to get a few things for a minute or two, and I can't smell anything so I'm not sure but maybe he's sensitive because he has asthma? The plan is to open all the windows on the 1st floor and to bring more fans in to circulate the air before moving back into the house. We also have two air purifiers that we'll put on when we stop by the house tonight. We are going to stay with my cousin for another night or two but have to leave her house Saturday morning as they have other guests coming to stay with them. We're looking into maybe camping in the backyard or borrowing a friends camper until the smell disapates enough that my husband can't smell it anymore. Do you have any other recommendations on how to handle the situation? It might not be the SPF at all, and a lot of compounds can cause irritation below the level where you can detect their odor, so I would not use odor as an indicator (though I can't think of anything better, short of paying a lab to come test your air, and even that won't tell you much that's useful). Sounds like you have a good ventilation plan. I would judge by the asthma rather than the smell, though. And since it's a full reno ... that smell could be anything. VOCs will dissipate pretty quickly, I would think, especially with the ventilation you have in mind. Good luck! The smell is definitely the insulation as we had a 2 week break beforehand and were waiting for the insulation to start and the smell (so says my husband) started immediately afterward and that was the only thing done on Monday. They did test the air for isocyanates after spraying on Monday and said there were none detected afterward. We've asked for the report confirming that in writing but aren't sure what else we can do. We are in the process of building a new single story home in northern Arizona. Our contractor recommends spray foam insulation throughout the structure. Please provide your thoughts on the use of this product in relation to health and safety concerns. I am just now consulting internet information and realizing there may be health reasons for not using it. Thanks for your question. Spray foam has unique performance attributes that make it really attractive. It also has some really gross stuff in it. Do you really need this product? What are the other options? Are you trying to build an especially airtight home to achieve Passive House or net-zero standards? If not, why are you bothering with an expensive, high-performance material like spray foam? Who will be installing this product? Talk to them directly if you can to gauge their level of knowledge about the materials they use. Do they know that isocyanates are potent respiratory sensitizers (exposure to them can cause asthma, and also they are asthma triggers if you already have asthma)? Do they actually follow the recommendations of the manufacturer regarding layering, cure times, and personal protective equipment? If they suggest to you that these guidelines are overkill or you get any whiff that they might not follow them, request a new sub because they have no idea what they're talking about. Ensure that no one in your family enters the jobsite while the spray foam is being installed or is curing. (This is much easier with new construction than with a reno, which is good.) Take this doubly seriously if anyone in the family has asthma. Find out what the relief plan for your family will be if it turns out the spray foam was installed improperly and you end up with a dud house because of it. I'm sure you've seen the nightmare stories .... These are rare, but you should negotiate who's going to take responsibility if you're one of the few this happens to. We are a new home owner with the foam insulation. I have many concerns we were not told about before being put in, we live in Texas lots of humidity but we had our windows open the other night to get fresh air and our builders has now informed us that with the foam insulation you can not open the windows or it will over work the A/C the next day it also holds the humidity in the house and causes the carpet and things to be damp? Why am I putting special windows so I can enjoy the fresh air if this can not be done? I was also told when lighting my fire place I will need to crack a window so the smoke goes up the attic. Could anyone tell me who I can call to have this foam tested. Also how do I find out what the company used in the foam. We were not at our house when this was done so we have in idea if there wore special gear or not. I am very concerned and would like to know more about this. What I can do and can not do. I was also told that if something fell on your rood (tree lim) u would not now if you had damage till the would started to mold and do even more damage. What have we done. You should be able to trust the builder on who they hire. 2. Very tight homes, regardless of the materials you use to make them airtight, are not generally compatible with burning wood in a fireplace. 3. The known risks from spray foam are for the workers who install it. You were wise to depart the premises during installation. As far as the experts know at this time, provided the spray foam cured properly after installation, occupant exposure to toxic chemicals in the foam is unlikely. 4. Many types of insulation (not just foam) absorb water and can mask the effects of a leak. highly insulating constructions to be realized for walls, roofs and floors"
I built house in 2009. In january of 2010 - this tangy smell started to come into my basement . It took two months to go away - i thought it glue - so i grinded floor - Then company that grinded floor - got silica over entire house - that took couple months to deal with. Then in Summer smell started again - hasnt gone away - so i had VOC test done last week - and the test found that the agent used to apply the foam is still off gassing - so if you can help please email jpaulsd@yahoo.com. Isocyanates are a highly toxic sensitizing chemical, responsible for documented worker deaths in the automotive industry. 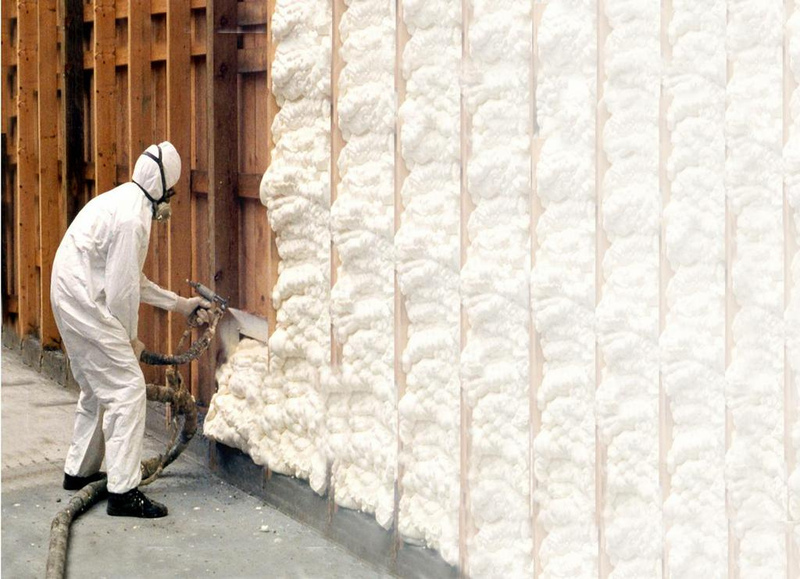 Spray polyurethane foam insulation, of any kind, uses isocyanates in 50% of the formulation -- even those claimed to be made with soy or other natural oils. This is not just a DIYers issue. The real issue is the improper formulation and installation of large amounts of spray foam in homes and buildings by poorly trained, unknowledgeable, or even unreputable commercial installers. Get the mixture wrong, the temperature wrong, spray too thick of a layer all at once, use a spray nozzle that hasn't been properly cleaned and maintained and you may get a bad installation and a house full of off-gassing toxic foam that will never properly cure. I personally know of at least six homeowners around the country who have had exactly this happen and they have had to evacuate their homes and find alternative living accommodations. Some of them are afraid they may never be able to occupy their home again because of the respiratory problems the isocyanates have caused now that they are sensitized. When one becomes sensitized, it essentially means there is no safe level of isocyanates your body will tolerate. When so many good alternative insulation materials are available that are truly green and have no health impacts, why take the chance of losing your home and your health by using polyurethane spray foam insulation?! Very nice article although I would like to have seen the "Let's hope that the general public doesn't jump to conclusions too rapidly" comment early on in the article and not at the end where many readers likely have moved on and made exactly that conclusion. Also, if the issue seems to be with DIY'ers and early occupancy, that should have been highlighter earlier on as well. Thanks again for a very informative article. See the guy in the Tyvek suit spraying this stuff? Proper PPE will include a respirator and safety glasses as well, which would be burdensome and uncomfortable as shown spraying foam on a wall, but in an attic spraying rafters? or in a crawlspace? Its true that off-gassing to future occupants is an important criteria on which to grade building materials, but shouldn't the safety and comfort of the installers be at least part of the equation when consumers make these choices? They say it you can't pronounce it you shouldn't be eating it. Maybe if even the EPA can't qualify how dangerous a product is, you shouldn't be financing the career of a person who will be breathing it because you spec'd it. Is Icynene's foam the one that is being applied to the underside of the roof decking? I have noticed some builders are applying some type of foam to the underside of the roof decking. We recently built a new home (just LEED certified at the gold level), and the choice of insulation was one of the most difficult decisions I had to make. Our builders encouraged closed-cell spray foam, as it is the best R factor per inch of insulation. We live in Minneapolis, so we really care about that. The American Lung Association also recommends it, for a different reason: it is the best for mold prevention. After reviewing the MSDS sheets on the closed cell spray foam, I had a really hard time choosing something so toxic to workers and the environment. But in the end, none of the alternatives were compelling enough for us, so we went with spray foam. (Our installer was fully protected, just like in the picture.) I look forward to the day when the products we humans make for our homes are both effective and non-toxic, and our choices are not a trade-off between one or the other. There is a large and growing number of anecdotal complaints about the health impacts of field-applied SFP foam, particularly low density or "open cell" proprietary urethane foams. These are without exception professionally-installed spray urethane foam insulations, not DIY projects. It's one thing to manufacture rigid foam insulations in a controlled factory environment and another thing entirely to manufacture foam insulation in situ in an uncontrolled environment with pressures to get the job done regardless of ambient temperature or relative humidity, and with the house occupants and construction workers as "canaries in the coal mine". In far too many instances, the home-owners have had to permanently vacate their new or newly-renovated homes because of chemical sensitivity apparently initiated by the insulation. As we know from other chemical sensitizers, such as formaldehyde, initial exposure causes increased and sometimes debilitating reactions to a wide variety of chemical substances. Aside from the logical absurdity of using petro-chemical foams to save petro-chemical energy (and the earth's climate), there are hygrodynamic reasons for avoiding relatively impermeable building materials such as plastic foam (I teach hygro-thermal engineering and building science). It's good to hear that the EPA is finally investigating this health impact, but I would not either put much faith in their objectivity or wait for a "final" recommendation. I have long advocated using natural materials (such as borate-treated cellulose or mineral wool) for insulation as well as for other elements of residential construction (real wood or plywood rather than OSB, and felt rather than plastic housewraps, e.g.) and for building breatheable structures rather than hermetically-sealed containers. It's past time for us "green" builders to stop accepting manufacturers' claims and apply real science and common sense to our material selections and design decisions.